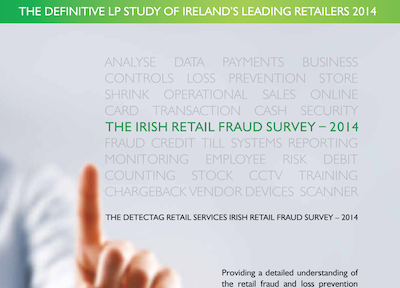 The results of the very first Irish Retail Fraud survey, unveiled at the recent Retail Fraud Dublin 2014 event, indicated that the Irish retailers are currently most concerned by shoplifting, employee theft and book keeping errors. Return fraud is costing retailers an average of 0.3% of sales. Online, the biggest concern for 59% of respondents was linked to the fraudulent use of credit cards followed by third party fraud (37%). Reflecting on recent online fraud events, 75% of retailers identify fraud detection capabilities as their biggest concern. The Irish version of the report, which is already established in the UK and US, was conducted by Retail Knowledge during the months of May and June 2014. The survey, performed either face to face or on the phone, covers 291 stores with annual sales totaling 1.6 billion euro and represents 10% of the total Irish retail sector by sales value. Respondents included members of staff involved in loss prevention from the likes of Argos, Arnotts, Mothercare, Lifestyle Sports, Woodie's, Carrolls Irish Gifts, GameStop, Rocks, Arboretum and Cummins Sport. On average, regarding the size of loss prevention departments, each member of the fraud prevention team is responsible for €34 million euro worth of sales. The survey found that Irish shrink levels average 1.1% of sales, which translates to €176 million loss to the industry overall. Shrink rate varies by sector however, from 1.4% for large format stores down to 0.2% for mass merchants and 0.02% for home shopping. The report found that manned guards are used by 53% of all retailers, while 40% of retailers do not use them in any of their stores. Security cameras are the most popular loss prevention system employed by 10% of retailers and considered vital to running a secure retail business. Back office safes are also popular (87%) along with tagging systems and forgery detection devices which are also used by 80% of retailers. Air tubes however are only used by 13% of retailers with stores. Other technologies used are cash counters, back office safes, forgery detection systems, secure storage at PoS. Online, analytics featured high in the list and were used by 58% of retailers. Payment security was higher than in the UK and used by 83% of retailers surveyed. The age of the systems in place was varied. The youngest are analytics systems averaging 8 years old, the oldest is tagging at 9.5 years old, security cameras average 8.3 years. Online, the oldest prevention systems are payment security averaging 4.2 years, followed by analytics and fraud management internal systems (both 3 years) and the youngest is fraud management external systems (1 year). The report found that most Irish retailers still separate physical and online security, something that Paul Bessant, MD of Retail Knowledge warns against.